"Modoki" is the Japanese word for "similar, yet different." Take for example the Tribeca Film Festival (April 21 to May 2, 2010), and October's New York Film Festival. Both are Manhattan cinema extravaganzas — whose overlaps end there. Populist Tribeca plays teriyaki to artsy NYFF's sashimi. Almost four decades the Lincoln Center event's junior, Tribeca was founded in 2002 by Robert De Niro, Jane Rosenthal and Craig Hatkoff to goad downtown development in the aftermath of 9/11. Never mind that the "Triangle Below Canal Street" has since ceased to be ground zero for the Festival. And who of today's TFF ticket buyers thinks he or she is subsidizing lower New York's economic and cultural revival? Rather, what continues to flourish are the Spring fest's display of popular, indie and world cinema and the celebratory mood that envelopes it. For the non-auteurist crowd, there are accessible Hollywood entertainments, ESPN-sponsored sports docs and family movies. Bring your kids; wear your sweats; Tribeca is the cinema equivalent of a cherry blossom festival. The inclusive spirit has its downside, however. TFF still grapples with the bad rap earned during its embryonic years, when the slate was crammed with duds. Around 2008, the Festival learned how to prune and the yield has generally improved. The eighth annual New York City Horror Film Festival kicked off in downtown Manhattan Wednesday night, Nov. 18, 2009, with a party for filmmakers and ticketholders at BLVD, on the storied avenue called The Bowery. Dedicated to the international genre film community, The NYCHFF was established in 2001 by Festival Director Michael J. Hein. Over 50 features and short horror and sci-fi films offer stories that range in subject matter from the terrifying to the gory and hilarious. 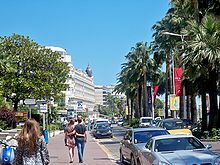 There’s The Cannes Film Festival, and there’s everything else: It is the global apex of the film festival circuit. Glamor Central: where the beautiful people come to try out what they learned in arrogance school. The girls at the American Pavilion began the day with yoga and gossip. The day I got there, it was early enough to see this routine. First there were the morning stretches, and then, exchanged news about the parties and rumors of parties they wished to investigate before going into a rousing rendition of the 1990s Walt Disney songbook --- they had seen Pocahontas and Little Mermaid tapes hundreds of times, I guess, and had the whole thing memorized. These are the shiny, happy people who spend most of the day waiting on tables where producers, actors, and journalists will be vastly overcharged for lunch and snacks after paying another €20 for the privilege of sitting there.